Within the holy hours of the Sabbath, and within the holy walls of the Synagogue, we find the story of a demoniac who encounters Jesus. Few stories are scarier to the human psyche than stories of demoniacs. Mark is careful to place this one at the beginning of his Jesus narrative, and he does so for a reason. This is a story that takes place within the most sacred boundaries (in both time and space) of religious communities, not outside them. The social phenomenon we are going to be discussing is not reserved for only religious communities, though. The unity of religious as well as nonreligious communities alike is maintained by this phenomenon. Mark’s point is that religious communities are not immune to it; in fact, they actually fare just as equally in this regard as their nonreligious counterparts. Unless there is a clear rejection of the phenomenon we are about to discuss, the religiosity of one’s community holds no advantage over nonreligiosity. Both kinds of communities become virtually the same—one simply happens to be religious. What is the way of sacrifice? Communities (including religious ones) rooted in exclusivity depend on a unity that is created around an agreement on whom should be excluded from their society. They need a “sacrifice,” someone to expel from within their borders in order for society to function properly. It is essential to the community’s smooth operation to find unity in being against what they define now as “other.” In fact, finding unity in vilifying someone is the very thing that gives communities of this nature their life. They depend on the existence of a “demoniac” . Much is lost in our rationalistic society today when we throw out the stories of demoniacs and exorcisms within the Jesus narratives simply because we cannot find a naturalist explanation for them. A Girardian  interpretation of the demoniac stories offers much in the way of providing an understanding of human societies as well as the stories of demoniacs that should not be dismissed too quickly. Demoniacs, within a Girardian reading, are more than merely those whom the community has chosen to expel. They are not merely innocent victims, scapegoats, or sacrifices. They are expelled victims, scapegoats, or sacrifices who have internalized the hatred of the community as a form of self-hatred. They have embraced and accepted the assessment of the community (legion) that they are deserving of being “stoned.” (To understand more fully how demoniacs have created this self-hatred, see here.) They have come to agree with the community that they are truly evil and should be driven outside the camp. 1. The demoniac encounters Jesus. 2. The demoniac refers to Jesus as the “Holy One of God.” This title is specific and included by Mark with purpose, too. Not only was this a title that David, the King, used for himself , it was also the title given to Aaron  who was the chief priest of a system of sacrifice with a scapegoat at its heart . 3. The demoniac assumes Jesus, as this chief holy one, has come to execute the sacrificial destruction. 4. Yet Jesus has come not to destroy lives but to liberate, heal, and restore. 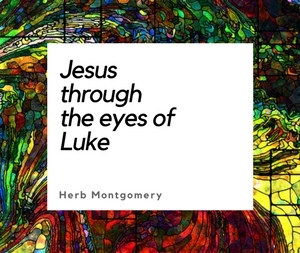 The demoniac encounters Jesus, and within the context of his internalized self-hatred the demoniac has received from his community of origin, he sees Jesus as the head or chief priest of this system of sacrifice who has come to destroy rather than heal him . Jesus had come to destroy not demoniacs but the very system that creates them. We can see this in the fact that there are two “authorities” repeatedly being contrasted here. What does Mark want us to see? “The manner of cure was this: He put a ring that had a root of one of those sorts mentioned by Solomon to the nostrils of the demoniac, after which he drew out the demon through his nostrils; and when the man fell down immediately, he adjured him to return unto him no more, making still mention of Solomon, and reciting the incantations which he composed. And when Eleazor would persuade and demonstrate to the spectators that he had such power, he set a little way off a cup or basin full of water, and commanded the demon, as he went out of the man, to overturn it, and thereby to let the spectators know that he had left the man” . Priestly exorcisms were full of ritual. They sought to expel the demon from the individual in a way that preserved the very system that produced demoniacs rather than allowing the system itself be called it into question. By contrast, Jesus completely bypassed the entire temple system of sacrificing innocent victims along with all the system’s rituals. Jesus sought to liberate the demoniac with no ritual and no preservation of the way of sacrifice, calling all who were present to reassess the way of sacrifice (both religiously and sociologically) and offering to everyone in the room that there is another way for human societies to form and function. This is what is mean by Jesus’s “New Teaching.” He used NO RITUAL—no preservation of sacrifice. What Jesus did was exactly the opposite. What does this have to do with us today? As we see in this story, internalized self-hatred can cause an outcast to view those who attempt to liberate them from their self-hatred as “the enemy.” The demoniac, who had internalized his community’s estimation of himself viewed Jesus and Jesus’ liberation from internalized self-hatred, as an antagonist and adversarial. I believe this story applies to matters of race, economics, gender (male/female, cis or trans), education, or orientation. This does not mean that I consider those who have been labeled as “other” to be possessed. Not at all! But many times they do internalize a self-hatred that was given to them by their community of origin. The Jesus narrative offers a Jesus who has come not to destroy us or who we are but to liberate us from the self-hatred and the internalized low self-estimation we have been given from our communities of origin because of who we are. (See here.) This is a Jesus who has come to liberate us from our own helpless captivity of believing that we are “less than” others simply because we may be different from those at the top of our societal privilege structures. We were all made in the image of God. We are all children of the same Divine Parents. There is room at the Family Table for us all. There is a place in Jesus’s new world for us all. The demoniac was delivered that day. But the congregation was, too. Maybe the world can operate differently from simply continuing to find people to expel. Instead of driving the demoniac away, Jesus both delivered him from his captivity to self accusation (think accuser) and abhorrence, and restored him to his rightful place within the new world Jesus came to announce and invited the demoniac’s community of origin to embrace this new world as well. This is the beginning of the Liberation stories of Mark’s Jesus narrative. 1. Spend some time this week in contemplation asking Jesus to show you where you, too, have internalized an evaluation of yourself that is different from what is true about you. According to the Jesus story, regardless of what your community of origin may tell you, you are of infinite, estimable, immeasurable worth, and there is room in Jesus’s new world for you. 3. Share with your upcoming HeartGroup. Till the only world that remains is a world where Love reigns, where each voice is valued and every person’s story is heard. Many voices, one new world. Rene Girard, I See Satan Fall Like Lightning. Psalm 4:3—But know ye that the Lord has done wondrous things for his holy one: the Lord will hear me when I cry to him. Psalm 15:10—Because thou wilt not leave my soul in hell, neither wilt thou suffer thine Holy One to see corruption. Psalm 106.16 LXX—They provoked Moses also in the camp, and Aaron the holy one of the Lord. John 3:17—Indeed, God did not send the Son into the world to condemn the world, but in order that the world might be healed* through him (*Definition of the Greek word “sozo”). Josephus, Antiquities VIII, ii, 5.